The United States has not learned enough about avoiding unwarranted wars. And if has not learned much about respecting the veterans of wars. This Veterans Day has a certain numerical resonance. World War I ended on the eleventh hour of the eleventh day of the eleventh month of 1918. Today, we recall the end of that horrific conflict, and those that have followed it, on the eleventh day of the eleventh month of the eleventh year of a new century. Unfortunately, World War I was not the “war to end all wars.” American soldiers continue to be thrust into unnecessary conflicts, fighting and dying in recent years in the undeclared wars of Iraq and Afghanistan. The United States has not learned much about avoiding unwarranted wars. And if has not learned much about respecting the veterans of wars. Just as in the aftermath of World War I veterans were abused when they made reasonable demands for economic justice at home, so veterans are today abused when they make the same sort of demands. After World War I, veterans seeking bonuses they had been promised were shot in the streets of Washington. 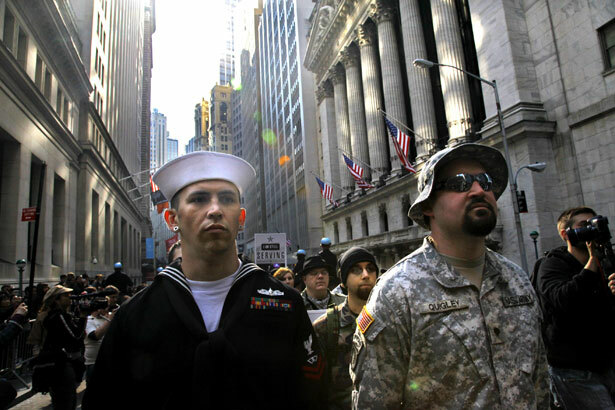 This fall, veterans were who survived the fighting in Iraq were wounded on the streets of Oakland, as they joined protests inspired by the Occupy Wall Street movement. The veteran who was most seriously harmed in Oakland was Wisconsin native Scott Olsen, who was twice deployed to Iraq with the Marine Corps. Olsen returned to a country that has neglected Iraq and Afghanistan veterans, and although he had found a good job, he remained concerned about the unemployed and homeless men and women with whom he served. Olsen joined two of the most vital vets groups in the country today: Iraq Veterans Against the War (IVAW) and Veterans for Peace (VFP). While still living in Wisconsin, he participated in last winter’s protests at the state Capitol against the anti-labor policies of Wisconsin Governor Scott Walker, which he recognized as being especially harmful to vets who continue to serve their country as public employees. When Olsen moved to the San Francisco Bay Area, he got involved with IVAW and VFP groups there. He joined his fellow vets this fall at Occupy Oakland events and he suffered a severe head wound while peacefully protesting the extreme measures taken against the Oakland protesters by local authorities. Those are important messages for this Veterans Day. The men and women who have served this country in its many wars hold many views about those wars, and about the country they swore an oath to defend. But they share a frustration with the “austerity” policies of politicians who talk a good game but then leave vets unemployed, homeless and neglected. Scott Olsen was injured while protesting those policies. On this Veterans Day, it is right to honor his service abroad… and at home. Indeed, it is right to honor all those vets who are demanding that the United States turn its attention away from unnecessary war-making and toward the necessary work of providing jobs, housing and education to the millions of Americans — many of them veterans — who make up the neglected 99 percent.